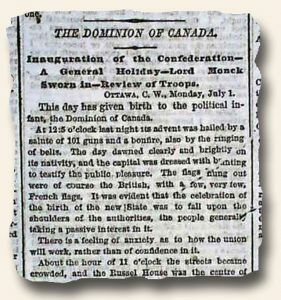 Earlier this week I traveled to New York City by the way of The New York Times dated July 2, 1867 where I found the headline “The Dominion of Canada” with the subhead “Inauguration of the Confederation — A General Holiday — Lord Monck Sworn in — Review of Troops”. “This day has given birth to the political infant, the Dominion of Canada…” This was the announcement of the birth of Canada. The Traveler… traveling to Rio de Janeiro… part of the “health test”?? I would have expected some items to celebrate a century.